10 MW (MegaWatt) solar power plant project proposed in the Rieselfelder near Luckenwalde. Updates on the original 1 MW solar farm project imply 7.15% (not 14%, see GP Correction note) Module Efficiency. Nanosolar, Inc. was back in the news late last month with the Nanosolar Blog post, “Nanosolar Ups Funding to $1/2B; Partners Strategically for Solar Utility Power”, regarding a March 2008 funding round. For coverage, please see “Nanosolar Confirms $300M Funding” by Jennifer Kho at Greentech Media or “Nanosolar Boosts Funds to Massive Half Billion Dollars” by Katie Fahrenbacher at Earth2Tech. Although I have not posted about Nanosolar since the cancelled eBay auction, I managed to find dated yet uncirculated news about Nanosolar GmbH in the regional German newspaper, Märkische Allgemeine. In April 2008, “ENERGIEPOLITIK: Viel Platz für die Sonne, Auf ehemaligen Luckenwalder Rieselfeldern soll ein großes Solarkraftwerk entstehen” (German only) by Elinor Wenke reported on the proposal to build a 10 MWp (MegaWatt-peak) solar power plant on 57 hectares (140.8 acres) at a cost of around €30 million or €3 per Watt. Beck Energy GmbH teamed with Nanosolar on the project located on the former Rieselfelder (please see My Google Map) in between the Berkenbrücker und Ruhlsdorfer Chaussee roads not far from the Nanosolar GmbH factory. Beck Energy’s Bernhard Beck would like to complete the project over the next year and said the 10MW photovoltaic plant can power 10000 residential homes with electricity each year. Echoing the Nanosolar Blog post, “Municipal Solar Power Plants”, released about the same time, Mr. Beck emphasized the benign nature of the plant on the environment. Grass can grow under and around the ground based solar arrays, and though large animals will be fenced out, smaller animals can live in harmony with the installation. However, the land cannot be used for agriculture and is owned by NUWAB (municipal water and sewage company) and the town of Luckenwalde combined with leased parcels. The land usage appears inefficient versus the Nanosolar metric of 10 acres per 2 MW. Perhaps land utilization is limited by existing uses or there are plans for future expansion? Per “ENERGIEPOLITIK: 30 Millionen Euro für Solarkraftwerk”, the Luckenwalde business and planning boards voted unanimously to approve the submission of a development plan for the project and to change the land’s zoning. Not surprising since the Luckenwalde town government helped Beck Energy and Nanosolar select the location for the solar power plant. 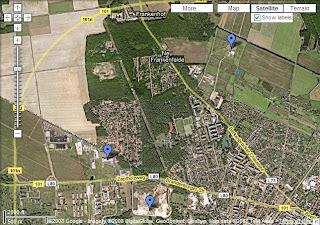 So what about the 1 MWp reference solar farm project located at the retired landfill in Luckenwalde, Germany, I first posted about “In Search of Nanosolar GmbH”? From May 2008, “WIRTSCHAFT: Sonnenschein über der Deponie, Am Frankenfelder Berg in Luckenwalde entsteht bis Ende November 2008 ein Solarpark” by Uta Franke reported on the laying of a ceremonial foundation stone with a time capsule and commemoration plaque for the 1 MW solar park on a sunny day in Luckenwalde. The solar park will cover 1.9 Hectares (4.7 acres) with a reiterated cost of €2.9 million or €2.9 per Watt despite a prior report mentioning a €3.5 million project cost. The project is supposed to be brought on grid by the end of November 2008 supplying about 400 homes with electricity. After the ceremony, Erik Oldekop, Managing Director, Nanosolar International, said about 7000 solar modules will be required by the 1 MW project. This tidbit implies each module delivers about 142.9 Watts presumably at STC (Standard Test Conditions). Next in June 2008, “WIRTSCHAFT: Sonnenmodul-Hersteller will expandieren, Stadt- und Kreisoberhaupt besuchen das Unternehmen Nanosolar” by Elinor Wenke reported on a visit by Luckenwalde town and Teltow-Fläming county officials to the Nanosolar GmbH production facility. figures correlate to Nanosolar’s claims of accelerating production expansion to 620 MW at Nanosolar GmbH noting the help of 50% capex (capital expenditure) subsides from the German Federal and Brandenburg state governments. Nanosolar employs about 30 people altogether and expects to increase employment to the 50 to 70 person range in concert with the capacity ramp. Nanosolar’s production line is a model of full automation with robots handling the processing steps for two (2) square meter glass plates used in the finished solar modules. At the time of the visit, the solar cells (produced in San Jose) and even the glass were shipped to the plant from the United States. Nanosolar GmbH Managing Director Olaf Dany said Nanosolar is in discussions with German firms to source the glass. Knowing the solar module power rating of 142.9 Watts and the two (2) square meter size, the implied Nanosolar Utility Panel module efficiency is about 14%, confirming Nanosolar Blog claims in the post, “Nanosolar Achieves 1GW CIGS Deposition Throughput“, =assuming= the various figures and information reported by the Märkische Allgemeine and stated by Nanosolar are correct. I have no reason to suspect they are not accurate. GP Correction: As a reader pointed out, my efficiency calculation was wrong. Oops! I read “2 square meter panels” to be 2 x 1m2 panels, one for front and one for back. Based on all photos that I have seen featuring this product, they are around 1m2 size – not 2m2 size. Think First Solar vs. Oerlikon. If they are 1m2, then they are at 14%. Pingback: GUNTHER Portfolio » Blog Archive » Searching for the Second Nanosolar? soy instalador de paneles solares, qisiera saber como importar desde uruguay los paneles solares de ultima generacion, con quien tedria que contactarme. ya he visto como los fabrican y he quedado ecantado. les mando un saludo cordial y se merecen mis sinceras felicitacioes. Espero tener ua respuesta lo mas agil posible.